As in “Victory Over Mrs. E.” Yes, it is our eleventh anniversary. And tonight is the party. Step three in the Easy and Elegant Life Party Planning Guide calls for the final setting up of the manse: buying the ice and the flowers, chilling the champagne, setting up the bar proper and a final carpet sweeping. I was to have had all the food prepared. As it stands, I will have to cook the roasts beef (not difficult) and assemble the miniature pastrami sandwiches before popping them under the broiler. The chicken salad in phyllo cups got dropped from the menu, simply because I forgot to buy phyllo cups and don’t feel up to the task. But then, the day is young. Having to prepare food before a black tie party presents challenges. 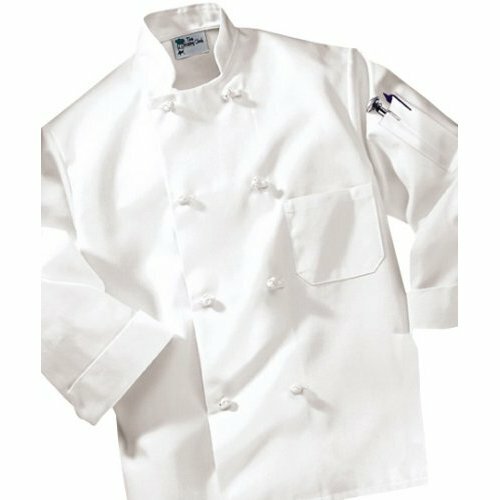 Which is why I recommend a chef’s jacket like the one pictured above. Mine was a gift from my mother one Christmas, and has stood me in good stead through many a last minute dinner party. The sleeves and full front are infinitely better at protecting my shirt from spatters and red wine spills. When will I learn to drink only champagne when cooking? As my jacket is a functional double-breasted model, I may even switch the side on which the jacket buttons to present a clean front to my guests before changing into my dinner jacket. Happy New Year, dear readers. My wish is for each of you to enjoy the coming year to the fullest and at a leisurely pace. Peace, health, prosperity and a dash of everyday elegance be yours in the months to come. This entry was posted in Entertaining and tagged Chef's Jacket, New Year's Eve. Bookmark the permalink. I have a chef’s jacket that I used for my halloween costume last year (kitchen nightmares). They’re just brilliant to pop on over what you’re wearing and quite inexpensive to buy at any uniform store. Happy New Year to you also! I have really enjoyed reading your blog this year. Also, happy anniversary!! Onward and upward for 2009!!! Happy anniversary and happy new year! The evening will be a smashing success, I know. Happy anniversary to you and Mrs. E! I too love the chef’s coat, at least one size too large, so it fits over whatever I might be wearing. It’s saved me on more than one occasion from having a last minute wardrobe emergency. Go for the chicken salad cups anyway, they’re always a big hit with our guests, this year I used chopped dried cranberries instead of my usual champagne grapes to add a bit of color and zest. Happy Anniversary to you and Mrs.E. Hope today as well as tomorrow, you continue to provide us with a dig of excavating our easy and elegant selves to new heights. Carry on. Hope that the clean up is not to arduous today but I know you will transform it to an easy and utterly graceful event. Happy anniversary. And here’s to a wonderful 2009.